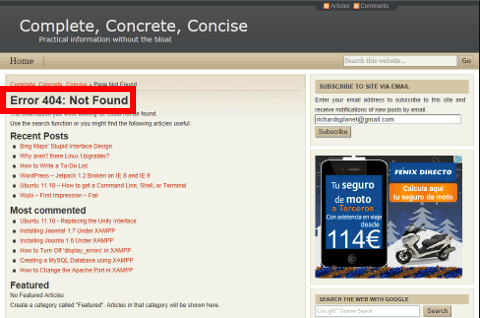 This post was my original attempt at solving the Error 404: Not Found error when trying to login to my website. It happened again and after waiting 48 hours for the problem to clear – it didn’t – I started searching for another solution. I think a reproducible problem / solution is better than a problem that mysteriously goes away after a while. However, I am not 100% certain this problem is fully resolved. I will have to wait and see if it happens again. If you are getting this message / error when you try to login and you used to be able to login just fine before, then the solution seems to be patience. This is likely a temporary problem with your webhost provider and is one of those problems that gets “miraculously” resolved several hours later. It’s no fun to wait, but that seems to be the solution. Of course, you can always contact your webhost provider and let them know about the problem. It took about 24 hours for this problem to go away for me (of course, some of those hours were spent sleeping, so it might have been less). During this issue, the site was still active, but it was not possible to login in to the admin page or to leave comments. I encountered this problem with WordPress 3.2.1, but searching the web, reveals this problem has occurred with other versions. From what I can tell, none of the stated solutions works – they just give you something to do (and I think it is the act of doing something – even if it seems pointless – that causes people to think the solution worked when just leaving it alone would have resolved the issue anyway). My first thought (well, after trying to login in a few times) was that my site had been hacked, then I focussed to resolve the problem. The first thing I did was shut down my browser (IE 9), clear the cache and temporary files using CCleaner, and restart the computer. I thought it might be some sort of connection problem. That didn’t work. Next I shut down my computer, turned off my modem and did some other things. I thought it might be a connection problem based on my IP address. My web host will automatically block IP addresses for an hour if it perceives a threat from that IP address. Turning off the modem means I will be assigned a new IP address when I turn it on a little later. That didn’t work. I thought it might be my webhost acting up, so I logged into the CPanel backend, but everything seemed to be working fine. To ease my concerns that I might have been hacked, I checked the date stamps on the WordPress files. They were all at least two weeks old (the last time I did an update) – no files had been changed in the past day – so I wasn’t worried about having been hacked. I tried accessing my site through w.bloggar (a blogging client, similar to, but older, than Windows Live Writer – you can read why I use w.bloggar instead of WLW here), but that didn’t work, It told me that the response it received back was invalid. Then I thought it might be CloudFlare acting up. This was harder to troubleshoot. I could always change the name servers back to the original name servers, thus bypassing CloudFlare’s name servers – but it would take up to 48 hours for the change to percolate through and, by that time, if it was a temporary issue, it might be resolved. I decided to (1) set CloudFlare to development mode – this means that for the next 3 hours, they pass all requests directly to my webhost. That didn’t work, then (2) I tried bypassing CloudFlare by accessing my site directly using my site’s IP address. That didn’t work either. At this point, I decided to search the web for help – turns out, I am not the only one to ever experience this problem. This site recommended changing the permission attributes on all the files and directories. Personally, I didn’t see the point. I checked my file permissions and they all seemed fine. I did not run the recommended fix because while some claimed it worked, others claimed it didn’t. I also had no desire to play with the core install (well, at least not yet). WordPress has its own help page for login problems. None of the solutions worked. Some of them actually render your site unusable. For example, the codex states: Rename the active theme folder… Once renamed, WordPress will revert to using the WordPress TwentyEleven theme., doing that results in a site that just doesn’t work. After a lot more research, some sites (a little past halfway down the page, comment by dremeda) suggest replacing the core WordPress files with ones from a clean install. Ugh! That sounds positively dangerous. Instead, I created a new WordPress site with my webhost – this one allowed me to login. Then I zipped up the working and not working sites and downloaded them. Then I unzipped them and compared the files using emacs. There was no difference between the files. Hmm. I then decided it would be safe to replace the core files of the “not working” WordPress site with the core files of the “working” WordPress site. This did not work either. Being tired and out of ideas, I went to bed. This morning, everything worked fine. Please God I hope your right. Mines been acting up, your story is so similar I thought It was me that blogged this. Haha. Thanks for giving me hope. Please let me know if this ‘magically’ clears up for you as well. Don’ forget to tell your service provider that you are having login problems. The strange thing about this is that while a number of people have experienced this problem (and it is scary when it is happening), there is nothing official oon the WordPress forums about this. Must be a hard to reproduce problem. Hopefully, I will never experience this problem again (and neither will you).